The position of handling the Office Administration is too pivotal as the person in charge of this will be managing various administrative tasks such as receiving and answering calls, organizing correspondence and directing visitors. The job description entails supporting and coordinating office tasks as well. 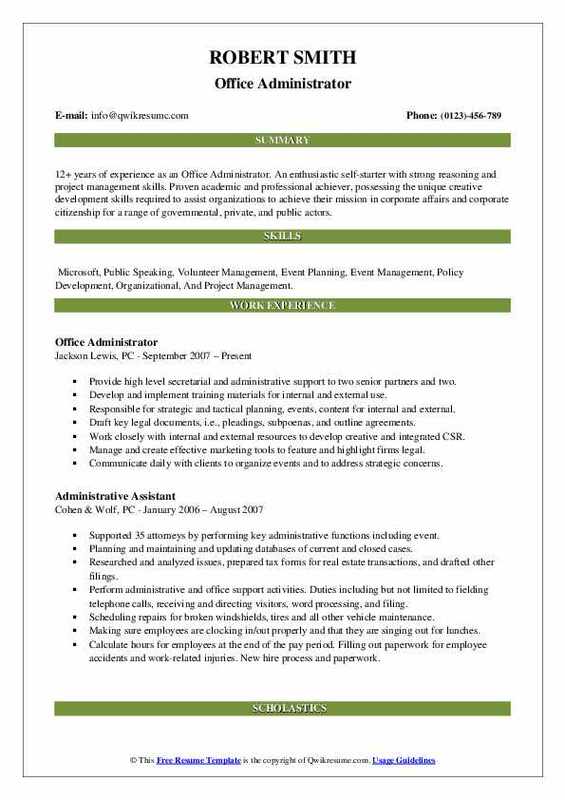 A Well-drafted Office Administration Resume emphasizes on tasks such as – assisting in bookkeeping, creating and updating files and records; supporting department staff, organizing refreshment and catering, assisting in travel arrangements, planning and overseeing disaster and emergency procedures, purchasing office equipment and supplies; and providing clerical or administrative support to other departments as well. 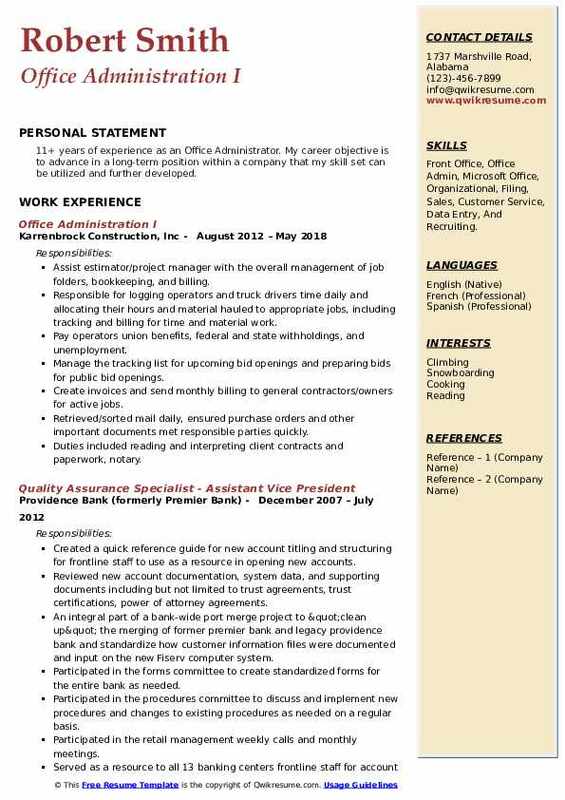 To handle the Office Administration role, candidates are expected to depict on the resume skills and abilities such as – familiarity with VoIP phone systems, prior experience handling administrative roles and responsibilities, proficiency in MS Office, multitasking ability and strong communication skill. While a degree in Business Administration is mandatory, possessing a CAP or professional certification will be an advantage. Objective : 5 years of experience as an Office Administrator and bookkeeper seeking part-time clerical or administrative support position while attending classes to earn a B.A. in Finance from UL Lafayette. Skills : Quickbooks Pro, Excel, Word, Accounts Receivable, Accounts Payable, Bookkeeping, Employee Relations, File Management, Cash Handling, And Executive Support. Maintain current sales, financial, and personnel records for all three locations. Continuous communication between site managers to promptly address and resolve issues in order to provide a professional and friendly experience. Advanced knowledge of Quickbooks accounting software and considerably familiar with ingenuity and auto data, financial software used in point of sale transactions. Routine handling of daily cash and check deposits into business checking accounts. Manage QuickBooks company file and maintain up-to-date records of all the employees. 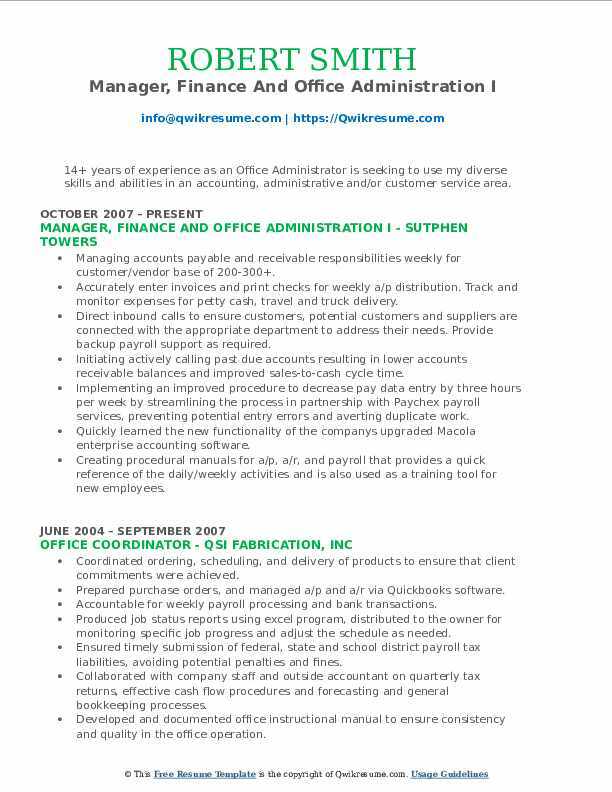 Highly skilled in recordkeeping procedures for both accounts receivable and payable. Daily correspondence with both vendors and clients in person, over the phone, and in person. 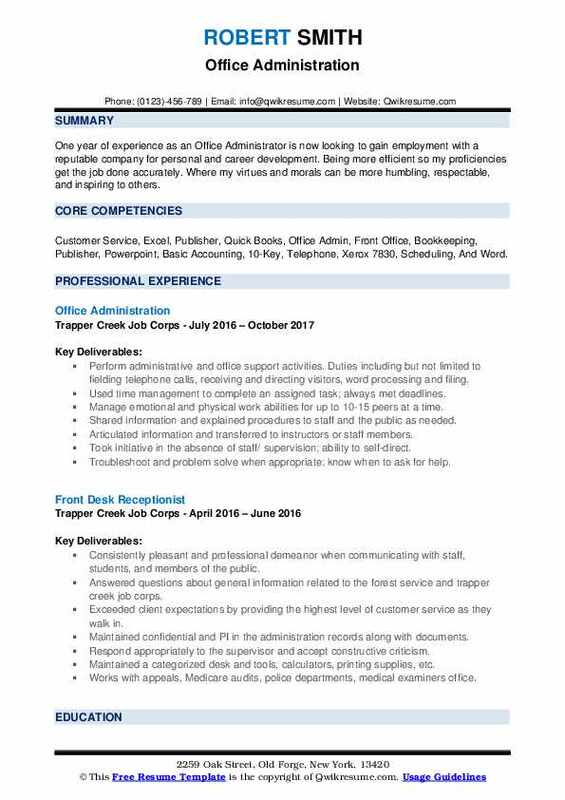 Objective : One year of experience as an Office Administrator is now looking to gain employment with a reputable company for personal and career development. Being more efficient so my proficiencies get the job done accurately. Where my virtues and morals can be more humbling, respectable, and inspiring to others. Skills : Customer Service, Excel, Publisher, Quick Books, Office Admin, Front Office, Bookkeeping, Publisher, Powerpoint, Basic Accounting, 10-Key, Telephone, Xerox 7830, Scheduling, And Word. Perform administrative and office support activities. Duties including but not limited to fielding telephone calls, receiving and directing visitors, word processing and filing. Used time management to complete an assigned task; always met deadlines. Manage emotional and physical work abilities for up to 10-15 peers at a time. Shared information and explained procedures to staff and the public as needed. Articulated information and transferred to instructors or staff members. Took initiative in the absence of staff/ supervision; ability to self-direct. Troubleshoot and problem solve when appropriate; know when to ask for help. Making sure employees are clocking in/out properly and that they are singing out for lunches. Calculate hours for employees at the end of the pay period. Filling out paperwork for employee accidents and work-related injuries. New hire process and paperwork. Maintenance vps checkbook, assign checks to employees, keep track of receipts and checks written from petty cash. 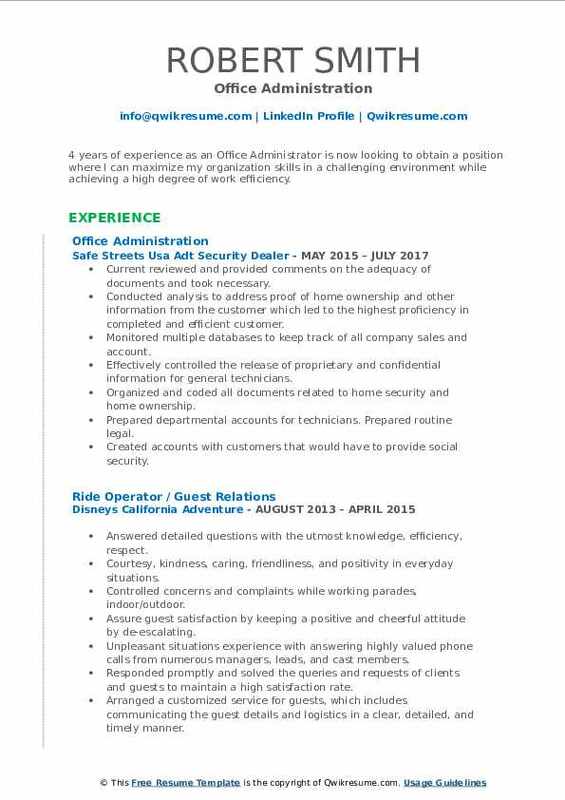 Summary : 12+ years of experience as an Office Administrator. An enthusiastic self-starter with strong reasoning and project management skills. Proven academic and professional achiever, possessing the unique creative development skills required to assist organizations to achieve their mission in corporate affairs and corporate citizenship for a range of governmental, private, and public actors. Skills : Microsoft, Public Speaking, Volunteer Management, Event Planning, Event Management, Policy Development, Organizational, And Project Management. Provide high level secretarial and administrative support to two senior partners and two. Develop and implement training materials for internal and external use. Responsible for strategic and tactical planning, events, content for internal and external. Draft key legal documents, i.e., pleadings, subpoenas, and outline agreements. Work closely with internal and external resources to develop creative and integrated CSR. Manage and create effective marketing tools to feature and highlight firms legal. Communicate daily with clients to organize events and to address strategic concerns. Created and manage information and research network for national trade secrets group. 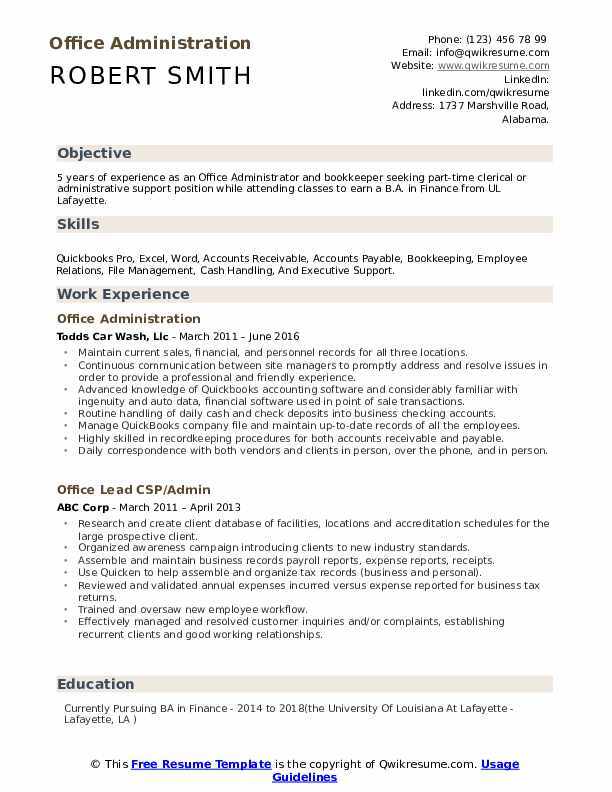 Objective : 4 years of experience as an Office Administrator is now looking to obtain a position where I can maximize my organization skills in a challenging environment while achieving a high degree of work efficiency. Skills : Core Qualifications Account Management Faxing And Scanning Documents, Client Relations Photos, And Forms Reporting Computer Proficient File/records Maintenance Excel In Microsoft Word/ Office, Reports Generation And Analysis Outlook, And Excel, Financial Records And Processing, Quick Learner, Contract Negotiation/Review/Drafting, Creative Problem Solving, Training And Development, Client-focused, Change Management, Attention To Detail, And Stress Tolerant. Current reviewed and provided comments on the adequacy of documents and took necessary. Conducted analysis to address proof of home ownership and other information from the customer which led to the highest proficiency in completed and efficient customer. Monitored multiple databases to keep track of all company sales and account. Effectively controlled the release of proprietary and confidential information for general technicians. Organized and coded all documents related to home security and home ownership. Prepared departmental accounts for technicians. Prepared routine legal. Created accounts with customers that would have to provide social security. Provided onsite training with multiple employees at once after six months after hire. Summary : 7 years of experience as an Office Administrator is now looking to provide superior customer service and dedicate talents and attention to serving both the company and the client. Skills : Microsoft Office Suite - Word, Excel, PowerPoint, Publisher, Outlook, Front Office, Customer Service, Front Desk, And Reception. Meet and greet all patients and visitors; assist as needed to provide exceptional customer service. Direct process incoming calls / make daily reminder calls to all scheduled patients. Schedule patient appointments for one NRT practitioner, 2 chiropractors, and 2 massage therapists. Receive and process patient payments and transactions / balanced daily receipts accurately. Coordinate and organize the e ordering of nutritional supplement products daily. Update and maintain a list of patients on the CLA program / collect renewal payments as needed. Consistently able to effectively handle multiple tasks, phone calls, patients, customers, etc. 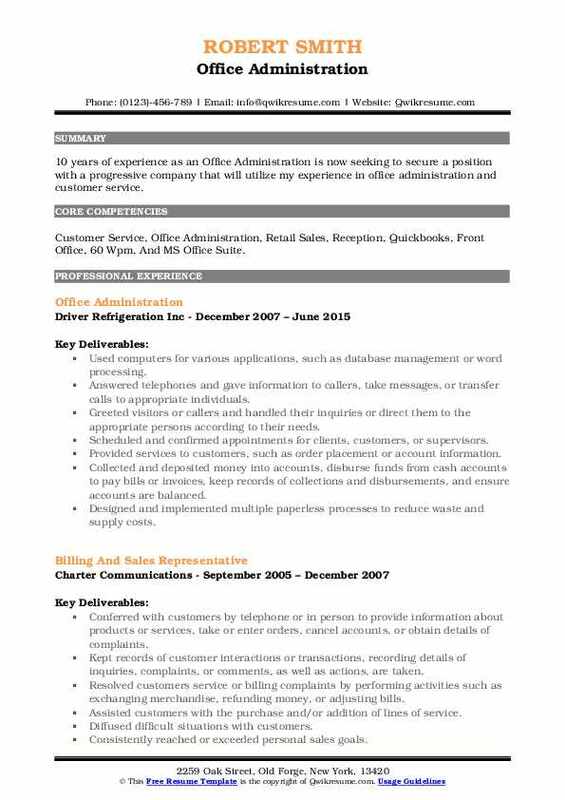 Summary : Over 10 years of experience as an Office Administrator, having expertise in Career Services, medical Collections, Sales Collections, and Administration skills. Proven ability to work in unison with staff and direct reports Strong written and verbal communication skills Great relationship builder, time management, negotiator and sales associate. 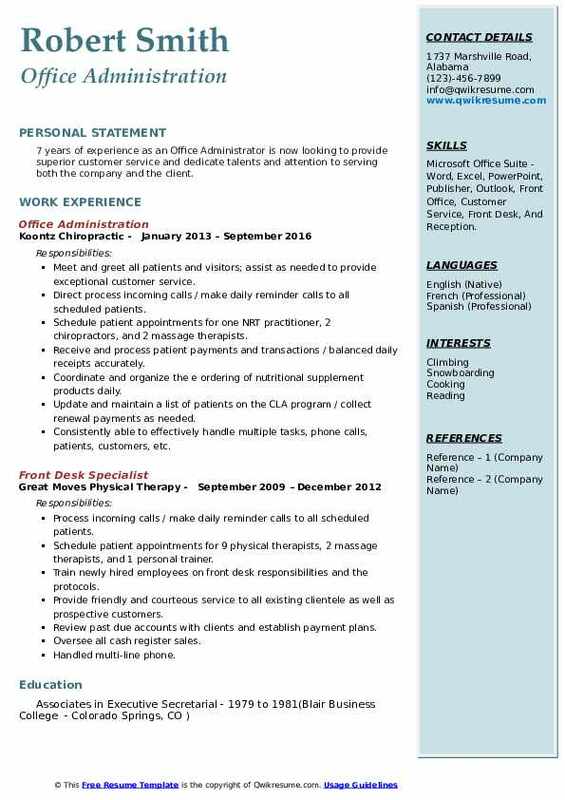 Skills : Front Office, Customer Service, Reception, 60 Wpm, Excel, Microsoft Word, Quick Books, And Office Admin. Review an complete contracts by monitoring collection, verification, and preparation of medical/homeowner association documentation. Created custom designed excel spreadsheets to reflect current pipeline and pending or aged transactions and or unsigned contracts. The first point of customer/client contact for general inquiries like payment methods, billing, and scheduling. Maintaining solid client relationships by handling their questions and concerns with speed and professionalism. Enter charges/insurance adjustments and use of custom computer software programs. Research and troubleshoot clients problems and resolve with one phone call. Maintain and support systems, workstations, mobile devices, printers, and peripherals. Summary : 14+ years of experience as an Office Administrator is seeking to use my diverse skills and abilities in an accounting, administrative and/or customer service area. 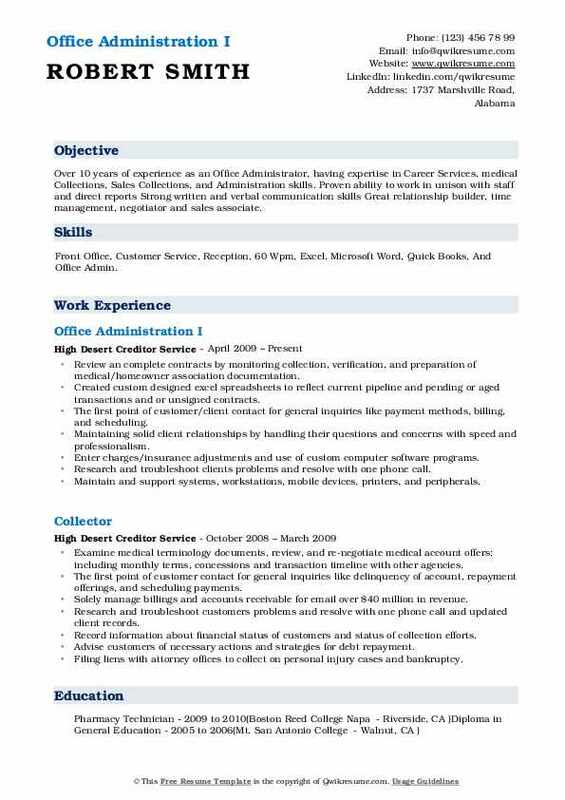 Skills : Microsoft Word, Keyboarding And Data Entry, Customer Service, Excellent Interpersonal, Problem Solving, Organizing, Excel With Time Managment And Multi-Tasking, Microsoft Office, Certified In CPR And AED. Managing accounts payable and receivable responsibilities weekly for customer/vendor base of 200-300+. Accurately enter invoices and print checks for weekly a/p distribution. Track and monitor expenses for petty cash, travel and truck delivery. Direct inbound calls to ensure customers, potential customers and suppliers are connected with the appropriate department to address their needs. Provide backup payroll support as required. Initiating actively calling past due accounts resulting in lower accounts receivable balances and improved sales-to-cash cycle time. Implementing an improved procedure to decrease pay data entry by three hours per week by streamlining the process in partnership with Paychex payroll services, preventing potential entry errors and averting duplicate work. Quickly learned the new functionality of the company's upgraded Macola enterprise accounting software. Creating procedural manuals for a/p, a/r, and payroll that provides a quick reference of the daily/weekly activities and is also used as a training tool for new employees. 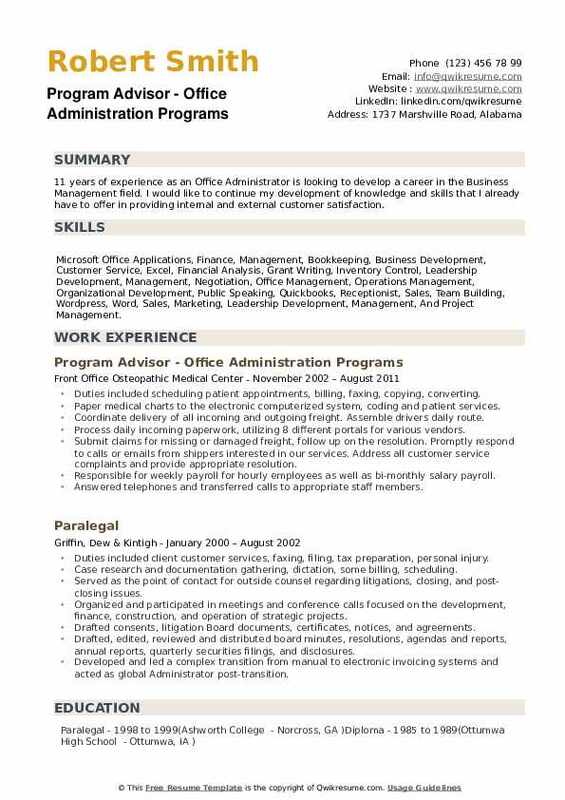 Summary : 10 years of experience as an Office Administration is now seeking to secure a position with a progressive company that will utilize my experience in office administration and customer service. Skills : Customer Service, Office Administration, Retail Sales, Reception, Quickbooks, Front Office, 60 Wpm, And MS Office Suite. Used computers for various applications, such as database management or word processing. Answered telephones and gave information to callers, take messages, or transfer calls to appropriate individuals. Greeted visitors or callers and handled their inquiries or direct them to the appropriate persons according to their needs. Scheduled and confirmed appointments for clients, customers, or supervisors. Provided services to customers, such as order placement or account information. Collected and deposited money into accounts, disburse funds from cash accounts to pay bills or invoices, keep records of collections and disbursements, and ensure accounts are balanced. Designed and implemented multiple paperless processes to reduce waste and supply costs. Summary : 11+ years of experience as an Office Administrator. My career objective is to advance in a long-term position within a company that my skill set can be utilized and further developed. Skills : Front Office, Office Admin, Microsoft Office, Organizational, Filing, Sales, Customer Service, Data Entry, And Recruiting. Assist estimator/project manager with the overall management of job folders, bookkeeping, and billing. Responsible for logging operators and truck drivers time daily and allocating their hours and material hauled to appropriate jobs, including tracking and billing for time and material work. Pay operators union benefits, federal and state withholdings, and unemployment. Manage the tracking list for upcoming bid openings and preparing bids for public bid openings. Create invoices and send monthly billing to general contractors/owners for active jobs. Retrieved/sorted mail daily, ensured purchase orders and other important documents met responsible parties quickly. Duties included reading and interpreting client contracts and paperwork, notary. Summary : 11 years of experience as an Office Administrator is looking to develop a career in the Business Management field. I would like to continue my development of knowledge and skills that I already have to offer in providing internal and external customer satisfaction. Skills : Microsoft Office Applications, Finance, Management, Bookkeeping, Business Development, Customer Service, Excel, Financial Analysis, Grant Writing, Inventory Control, Leadership Development, Management, Negotiation, Office Management, Operations Management, Organizational Development, Public Speaking, Quickbooks, Receptionist, Sales, Team Building, Wordpress, Word, Sales, Marketing, Leadership Development, Management, And Project Management. Duties included scheduling patient appointments, billing, faxing, copying, converting. Paper medical charts to the electronic computerized system, coding and patient services. Coordinate delivery of all incoming and outgoing freight. Assemble drivers daily route. Process daily incoming paperwork, utilizing 8 different portals for various vendors. Submit claims for missing or damaged freight, follow up on the resolution. Promptly respond to calls or emails from shippers interested in our services. Address all customer service complaints and provide appropriate resolution. Responsible for weekly payroll for hourly employees as well as bi-monthly salary payroll. Answered telephones and transferred calls to appropriate staff members.